I recently launched a Ruby on Rails based application and wanted to add HTTPS to my domain. In this post, I'm going to show you how to add HTTPS to your domain using a tool called Certbot. HTTPS is an essential service for modern web applications. An HTTPS-enabled website will encrypt all of the data sent between you and the website server. This protects your passwords and other sensitive information from third parties on the Internet such as other users on your local Wifi network. HTTPS can also be used as a means to help users identify that they are on a correct website and not a scam website doctored to look like an authentic website. With the major web browsers like Chrome now labeling non-HTTPS enabled websites as insecure, HTTPS may soon be a required feature for website delivery. Ubuntu Linux 18.04 (Bionic Beaver) - this won't work for Heroku or Windows. In this example NGINX serves three functions: 1) Integrate our HTTPS certificate into transport layer. 2) Redirect traffic seeking the HTTP port 80 to the HTTPS port 443 to force clients into using the more secure protocol. 3) Route web traffic to the appropriate container for the domain name of the request. This will allow us to serve multiple websites using the same Linux server. 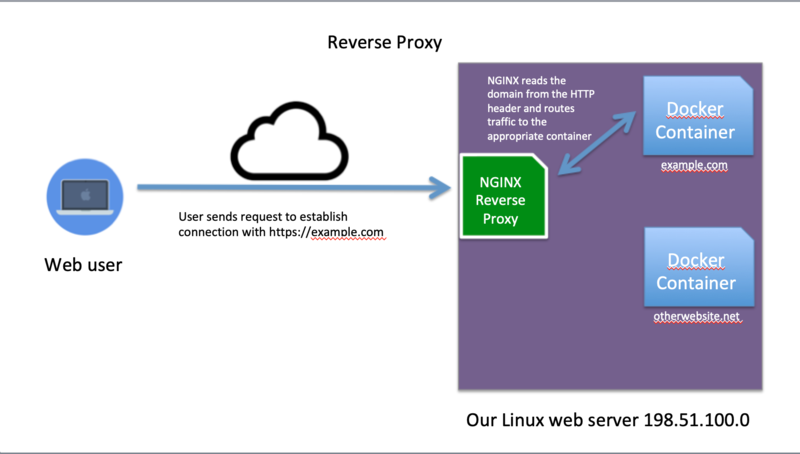 This kind of setup for routing web traffic is called a reverse-proxy. How do you install NGINX? What is Let's Encrypt and Certbot? Let's Encrypt is a nonprofit organization that promises to be the Internet's free, automated, and open Certficate Authority (CA). Several companies such as Symantec, DigiCert, GoDaddy are also CA's and offer certificates for a fee. For HTTPS to work, your server needs to install a certificate from one of these companies, which is nothing more than a private encryption key associated with your domain. When a client connects to your website, your server will send a message encrypted with that private key, which can be decoded by a public key on the client's end. HTTPS enabled web browsers like Firefox or Chrome come with these public keys preinstalled, per an arrangement with the CA companies. If you want a more general overview of how HTTPS certificates work, here is a great YouTube video explaining the process. Let's Encrypt has made the installation and renewal of SSL Certificates easy with a tool called Certbot. Certbot validates your server to the Let's Encrypt by having it perform what it calls an ACME challenge. An example would be when you run Certbot, it will make a temporary file available via HTTP which the Let's Encrypt organization can access. Let's Encrypt will then check the DNS records to verify that the domain name you want to certify points to the server you are running Certbot from. If the DNS matches, then Let's Encrypt will send a newly issued certificate to your Certbot. Notice that I also installed the python-certbot-nginx module, which invokes our instance of NGINX in performing the challenge. All you need is an A or CNAME record pointing your domain to the IP address of your Linux server. Passing the nginx flag tells Certbot to use NGINX to perform the ACME challenge. Certbot temporarily modifies the NGINX settings so that the remote Let's Encrypt system can find a file on your system to complete the challenge. Once complete, it will automatically install the received SSL certificate, which will act as a private key during the HTTPS initiation. Certbot should update your NGINX settings automatically, but here's now it will look after.